The focused visage of Karajan looms large on the front cover of this Blu-ray, and I was drawn to it to see if it would reveal anything about his mythical style of conducting. It seemed hopeful that it contained a short documentary entitled The Art of Conducting. In reality, though, it tends to show the conductor at his worst. It begins with a brief interview with Joachim Kaiser, the famous critic who also spends a lot of time with Christian Thielemann in his Beethoven set, but there isn’t much to that beyond a few truisms. Most of the film consists of a “rehearsal” of the opening of the Fifth Symphony’s slow movement, but it’s cringe-worthy in every way. It consists of an unnamed conductor rehearsing the violas, cellos and basses of the Philharmonic, and Karajan then comes on to give him advice. It’s meant to look natural, but it’s actually so contrived that it’s comical they ever thought it would convince. They’ve clearly practised their interactions to within an inch of their lives, and you see the classic Karajan obsession with his image, from the fake shadow projected on the back wall, even down to the way he leans over the piano so as to project his best side. Nor is there much technical chat that is illuminating, save a discussions of the importance of rhythm and legato, then eliminating the joins of the bar lines. I think I picked up that this was part of a planned TV series that would broadcast all nine symphonies together with “rehearsal” footage to give the public an insight into how the whole process of conducting and preparing a symphony works. I wonder how far it ever got, however? The performance of Beethoven’s Fifth is far from a classic. For a start, the mono sound is tinny and ungrateful, and the pitch is too high. The shine on the brass is also abrasive and particularly grating at the launch of the finale. It’s black and white, but at least you get to see a bit more of the players, unlike the normal uniform focus on the conductor. He still hogs the limelight and Clouzot conspires in this, most absurdly in the close-up of his hands at the start of the exposition repeat. The reading as a whole is exciting and driven but the whole effect is very artificial, even down to the steeply raked placing of the musicians in the studio. All in all it shows the conductor and his excesses of image at their worst. The focus of the film is still overwhelmingly on Karajan, though you see notably more of the musicians' faces — rather than just their instruments — than you would do on one of the conductor's infamous films from the 1960s or 1970s. There's also the excitement of the live occasion: Karajan filmed live is nearly always preferable to one of the conductor’s studio projects which can smack of the vanity project. As for the performance itself, there is an implacability about the first movement that not everyone will enjoy, but it's certainly a valid reading and the orchestra are all admirably committed to the same vision as the conductor. Countless details stick out, such as the clarity and precision of the tremolo strings towards the end of the recapitulation that drives the tension forward so unarguably. Then there's the soaring beauty of the cello line as they prepare the way for a coda that builds with inexorable force while avoiding sounding laboured. In fact, it's impressive just how much forward movement Karajan manages to build in. Rattle famously called him “the Emperor of Legato”, but that doesn't mean slowing or losing energy, and the Scherzo here is faster and more powerful than any other reading I've heard of his. The Adagio, by contrast, is shaped with loving beauty, and the strings respond in kind. Not just that: the horn solos at the 66-67 minute mark are delightful. Those cello and bass recitatives that open the finale are enormously impressive but the main Ode section does become a little relentless with throbbing drums and driven, ostinato-like orchestral sound, especially in the main fugue. The soloists are fine, but the chorus are a bit of a yell. Mind you, that’s a problem Karajan regularly had, and his frequent recordings with the Vienna Singverein, an institution to which he was inexplicably loyal, seldom sound much better. 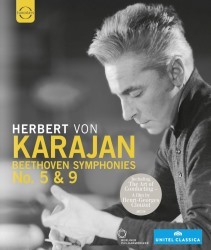 Karajan’s recordings of the Beethoven symphonies are famously legion, and any of his Fifths is preferable to this one, but this Ninth is worth investigating, not least for a fascinating comparison with his second BPO recording, with an almost identical cast of singers, which had been polished off in the studio just before this concert.